Well welcome back for another year of knitting fun! The holiday period always seems like a huge hurricane of so many wonderful things, not the least of which is a whole lot of knitting. Over the last couple of weeks I've been thinking a lot about The Tweed and where I want to go this year with knitting. I have some new plans and interesting twists to introduce this year, so I hope you'll stick around. And if I don't say it enough - THANK YOU - for visiting, reading, commenting, e-mailing, and general good-vibe sending. This website has been a wonderfully unexpected project in my life and I am excited to see where it will go this year. Now - January. The month in which we get to blab all about our secretive holiday projects. They've been knit, given, well received and hopefully well worn. Now the only thing left to do is dish out the good stuff - so that's what I plan on doing this month. I thought I'd start the holiday knitting spew with a really fun EZ project that took me a mere couple of days and was very enjoyable. These were knit for a dear friend who is weathering the winter in rural Minnesota - she needs all the woolies she can get! Modifications: I was making these for tiny little lady hands so I nipped them down a bit from what the pattern suggests. Rather than casting on 48 stitches at the base, I did 44 and decreased down to 40 after about a 2.5" cuff. It's a great pattern because you can virtually knit it at any gauge as long as your stitch counts are divisible by 4. Very easy to custom fit. I chose garter stitch for the cuff, rather than ribbing, because I like it better. Thumb placement is also simple - just check out the receiver's hands and see where their thumb is located. Since it's done as an afterthought, you don't have to worry about thumb placement while knitting the body of the mitten. Another reason this project is super quick. The Yarn: I had seen a couple of versions of these knit up in self striping yarns and thought they looked great. As for the striping, I just let the Noro do it's thing - I like their asymmetry. The thumbs are put on as an afterthought as mentioned above, so I just did my best in matching color with my remaining yarn so there wouldn't be a dramatic color shift between mitten and thumb. I have reports that they fit perfectly - which is a relief, since I was going on memory about handsize. Whew. A Bit o' Business: If you've had problems e-mailing me over the last month or two - please accept my sincere apologies. My mail forwarding was malfunctioning, unbeknownst to me and bouncing a huge amount of e-mails back to you. It's all fixed now, so don't fret at firing e-mails on over to me at jared [at] brooklyntweed [dot] net, or just click the "e-mail me" link in the sidebar. Also, for all of you who have been searching high and low for a Cobblestone Pattern, there's no need to look any further than your computer screen. The lovely folks at Interweave are now offering it for online purchase (details behind the link). Thanks for all of your e-mail requests after the issue sold out - it was killing me that I couldn't get the pattern to you then, but now it looks like the problem is solved. Happy Knitting! 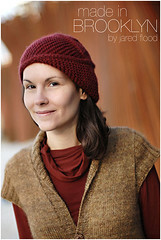 Congrats on having another Interweave pattern up for individual sale. That's very cool. Fantastic mitts, love the Noro for this. A very Happy New Year to you! Lovely looking and I know how soft Silk Garden gets with use. I was also thinkng of making these mitts, but didn't have two skeins of Kuryeon that matched. I do have two of Silk Garden, but I wasn't sure it would be warm enough. Were you going for a tightly knit fabric? Is your friend finding them warm? because of you i've ordered that book (seen other items you've knit from it) and I plan to slowly add more of her books to my library, I just have one of her books which I think is the pink one with handwritten newsletters in it. Sometimes her patterns confuse me but I just love them I'll keep trying till i get it lol. Gotta love all things that are inspired from the genius EZ. Speaking of cobblestone, I have one on the needles now for a friend who needs a nice warm layer. my husband and brother, who until now have said they were much too warm for a full sweater, are looking on the growing cobblestone with undisguised envy. I (happily) forsee more in the future for this knitter! ohhhhh looove these mitts. The look great in the Noro! good work, they look beautiful! the colours are great, so are your pictures! Glad to hear that Cobblestone is available--it's going on the must-knit list if I can ever choose yarn. I love that they are not exactly the same. Happy new year and thanks for your blog! 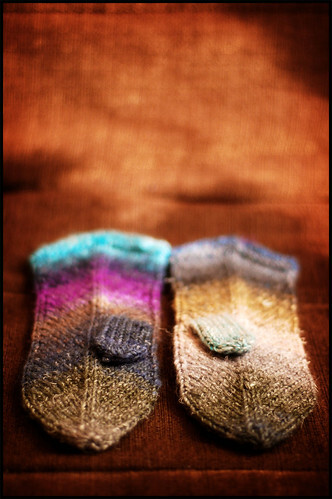 Hope you had a great holiday - the mittens look great - awesome use of Noro! Your mittens are fabulous - love them. Your Zimmerman infuence is just delightful! The mittens look really really lovely. I picked up the Knitter's Almanac just two days ago, so maybe there are some asymmetrical mittens in my future, too! These are very inspiring. Like everything you do, the mittens are beautiful. Glad I bought the IK issue with cobblestone in it. I love the way the increases are hidden in the garter section; the recipient loves it, too. I hope that you're getting royalties from IK on the independent sale of the pattern. I have a question about cobblestone. I knit it, and I couldn't find a way, when doing the short rows in the yoke, to avoid gapey holes in the purl rows. Wrapping them as the knit rows only made it worse. I've encountered a few people on ravelry who had the same problem. It's no big deal - I darned them in and you can't tell, no way. But given the general elegance of teh pattern, it was just a niggly little annoyance. Since I'm planning on knitting it again, it'd be nice to know how to avoid this! Oh my, what a coincidence. I was just humdrumming through her book today pondering these same mittens. I even thought they would be lovely in a variety of colors, such as the jay walker socks. Very beautiful mittens. I hope who ever receives them, loves them fully. Happy New Year. I have been enjoying your blog for over a year now. I don't often comment but I send good vibes while passing through. Wishing you the best in the coming year. They are truly a piece of art. Your projects are forever exquisite! You may have pushed me right over the edge on these mittens. I'm in a bit of a Silk Garden fanatical phase, I just keep knitting scarves (you pushed me over on that one too). Thanks to you, too and Happy New Year! Beautiful! Can't wait to see what other holiday goodies you have to share! Beautiful mitts, Jared. 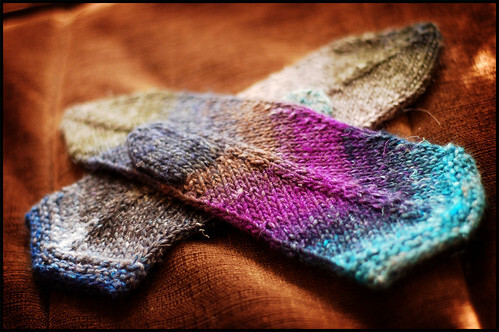 The asymetry is gorgous and that Noro takes the cake. Happy New Year to you. I wish you all the best in the coming year and congrats on your success with Cobblestone and your blog!! I look forward to seeing the goodies you have to show off this year. happy new year!! absolutely love the mittens. ditto on the previous poster's comment about publishing the blue sweater pattern. The mittens look great. I've been wanting to do these for a while. Might be sooner rather than later now that I've seen yours. happy new year jared. the mittens are as elizabeth noro as can be and i love them. i wish for lovely knitting experiences and inspirations coming your way this year, too. You're the best, Jared! You don't post very often, due to your busy schedule, but when you do. . .Wow! Happy new year to you. We all look forward to whatever you have in store for us. 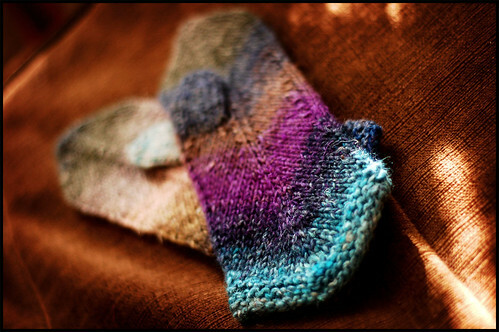 cute mitts - simple pattern, but the noro really makes them shine! Fabulous mittens! You have a wonderful eye for colour. Lovely mitts, I've never been inspired to make them until now. I think I'll cast on this week! Thanks for the constant inspiration. They're phantastic - as is your blog! these are gorgeous! now i know what i can do with those extra skeins of silk garden i have hanging about. Those are terrific! I generally prefer a gusset thumb though, but this would be a good chance to experiment with making an afterthought thumb on the side of the mitten. Yes, I do hope the Big Blue pattern is published at some time. It is super and so are the mittens! I'm slowly working away at the Cobblestone and I just love it. Happy 2008! I seldom comment, more of a lurker myself, but I know that comments are nice every now and then. I love reading your posts, enjoy the format of the page and think your patterns and projects are gorgeous. I have the EZ almanac so now I need to go look up this mitten pattern. I hope you have a wonderful 2008 and look forward to reading your blog this year. You're a marvel! (Wish I could find more sites like yours). I just finished a couple pair of the mitered mittens and never thought about se;f striping yarn. Looks like I'll have to make yet another pair! Happy New Year to you too - and thank you for all of the fantastic inspiration and enjoyment you've given me through your blog in the past year. I look forward to seeing everything you make this year!! Very beautiful. You have such an eye...and yes, Happy New Year to you too! Beautiful! EZ never fails, but her patterns are enhanced by your taste in yarn. I've been seeing so many lovely mittens this year that I'm beginning to wish I needed some. such gorgeous colors and transitions. i love the contrast of the one colorful cuff; it somehow makes every single other color in the mittens imminently desirable. Jared, I have read your blog and been lurking for a while...I had to comment this time! The mittens are beautiful, I adore your sweaters, and the photography is exquisite! I aspire to make my blog more like yours! How you can knit so much in so little time I have no idea! Thanks for the reading pleasure, and I look forward to the twists in the future! Lovely mitts. Mittens may just make my must knit list for 2008. Happy New Year! Gasp! So beautiful. I might just drop everything and make a pair! Those are stunning! The bright colors just pop out and force you to take notice. I love so many of the EZ patterns I see. I really should just bite the bullet and get the book (someone above did mention a book, I wasn't misreading) and play around. With the rampant stash, it is always a good idea to use patterns that are geared to know your gauge and your math and go. wow and now i see a new published pattern in your side bar. daring to call anything a smokin' anything these days. except maybe for smoking hot needles. it looks great. to bad i cannot just go down and browse the book at barnes and noble. I made one mitred mitt in Kureyon and loved the colours, but found the slant of the thumb insert very annoying and uncomfortable. It pulled in an odd direction because of the angle of the mitre. I ripped mine out. Lovely! I have been craving to work with some more Noro lately and thinking about some mitts. I think they will be fingerless, most of my friends live in the PNW and mittens seem like overkill. Noro is always so entertaining to knit up! I like the mittens. Exciting to hear that so many people liked the cobblestone. I made it myself and thought the pattern was very smart. A friend told me that my husband looked like he was wearing midevial armor. He wants a big blue now!! Hi Jared--these mittens are little lovelies--I wondered just how tiny this little sprite is? I've got a tiny 10 year old niece with teeny hands--wondered how you'd size these? Were they more for a 4 -5 year old...do you think you could figure out the size? Love the mittens, I'm going to try to wait until May to knit them. I'm trying to do the Almanac in order this year. If the mittens are as fun as the aran sweater, I'm in for a treat! 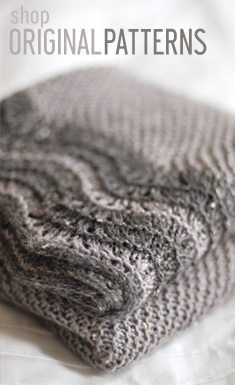 I love your cobblestone pullover so much that I will be making one for myself. Just need to figure out the numbers for a female version. Can't wait! Keep up the amazing work. I made my man your Cobblestone using Peace fleece...I just needed to go down a size on the pattern to get his chest size so the calculations were easy. How come you make everything look so darned beautiful? Now I want to make those mitts, I don't have time I tell you!! Really like the mittens. I've been wanting to knit some for my daughter. I'll have to see if I can't size them down to fit her tiny hands. Nice idea to use the Noro. The mittens are great and you've given me a great idea for leftover Noro. I'm looking forward to seeing what you'll be up to in the new year. Like another comment, I too have bought the EZ Almanac because of your enthusiasm. thanks for the pictures of the great mittens. Photos in the book are difficult to see. These look fun to make. Your knitblog makes my day, and you've therefore been awarded the You Make My Day -award on my blog. Lovely mittens. I'm glad they were received with such joy. I knit some stranded mittens as a gift this year, and was very disappointed at the total lack of enthusiasm. Oh, well, gift cards for them next year! I look forward to your 2008 posts. these are gorgeous. I can't wait to make my own pair, but I'll be "winging" it, rather than buying a pattern. I think I can do this!